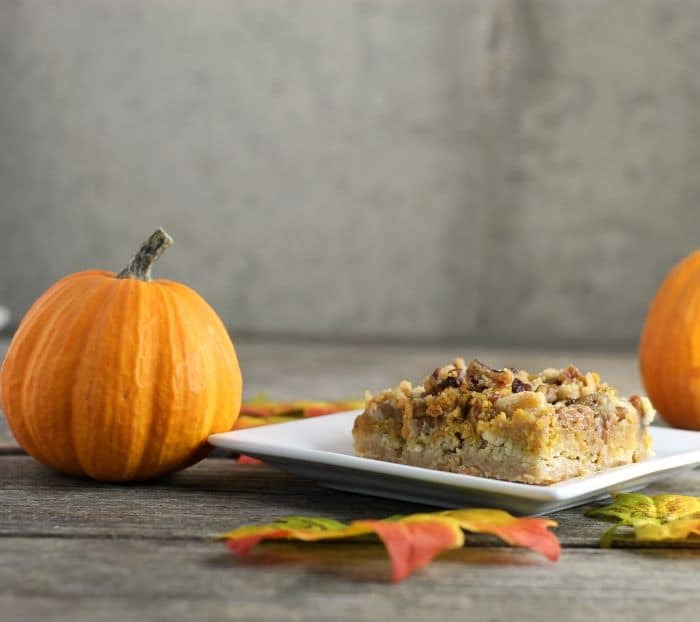 Pumpkin cream cheese bars are a perfect blend of cream cheese, pumpkin, and spices perfect for the fall holiday season. Pumpkin cream cheese bars taste a bit like pumpkin pie only better, because there is cream cheese, caramel bits, and crumble involved. Even if you are not a fan of pumpkin I think that you might enjoy this recipe. Can you believe that Halloween is just around the corner? That means that the holidays will soon follow. All I have to say is where did the summer go? When it comes to holidays, I look forward to the pumpkin pie. And on Thanksgiving Day there is always a pumpkin pie for dessert. By the way, did I mention that sister makes the desserts for Thanksgiving? Yeah, she does make the pumpkin pie, but she makes six other kinds of pies. It is always a hard decision in which pie to take. But I always make sure that I have a small piece of the pumpkin. These pies have become a tradition that everyone in my family looks forward to. Do you like pie during the holidays? I am sure there a few you that don’t like pie or maybe the crust on the pie. 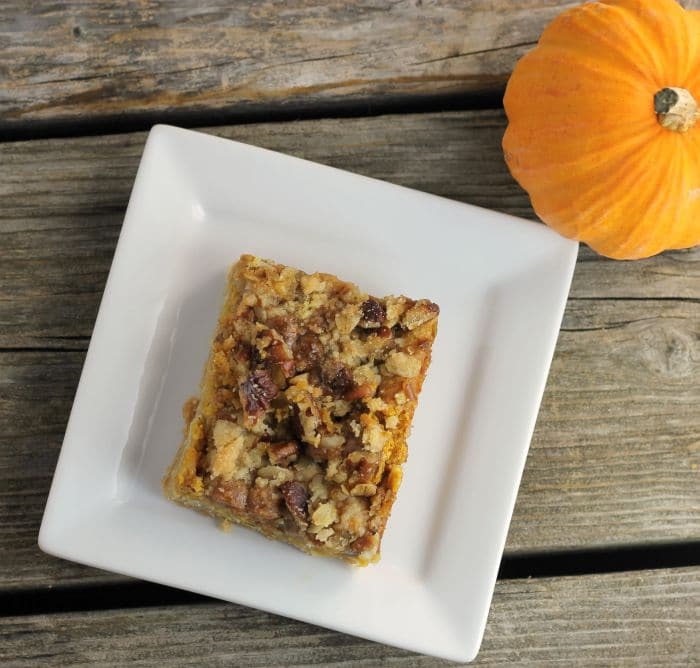 So why don’t you try something different and try these pumpkin cream cheese bars? 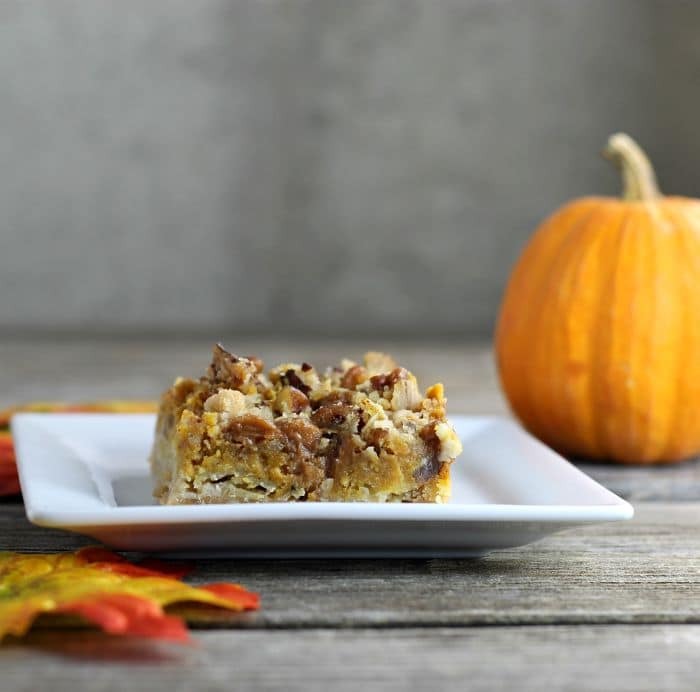 The base of the bars is made with an oatmeal crumble, the filling features pumpkin and cream cheese, and the top has more crumble. And who doesn’t love a good crumble? If you know me at all you know that I do. I love the fall spices and these bars have my favorite’s cinnamon, ginger, nutmegs, and cloves. 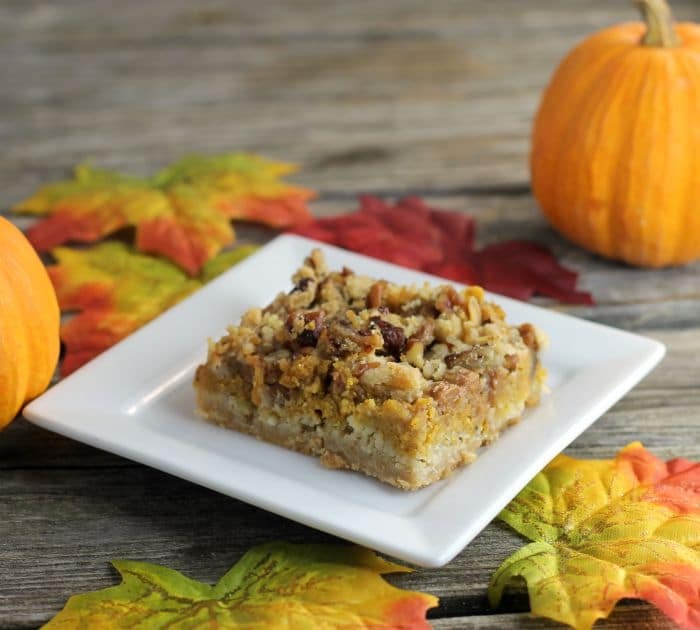 Hope you enjoy this pumpkin cream cheese bars recipe. Preheat oven to 350 degrees F. Grease a 9 by 13-inch baking dish. For the crust combine the flour, oats, sugar, brown sugar. Add the butter and cut in with a pastry cutter or fork until crumbly. Reserve 1 cup of the mixture for the topping. While the crust is baking prepare the filling. Beat the cream cheese with an electric mixer for a 1 minute or 2 until creamy. Add the sugar, spices, and salt and beat until well blended. Add the eggs and beat in. Add the pumpkin puree and beat in. For the topping add the chopped nuts and caramel bits to the reserved crumble. Once the crust has baked for 10 minutes remove from the oven and pour the prepared filling over the crust. Sprinkle the topping over the pumpkin mixture. Place back in the oven and bake for another 45 to 50 minutes. If you prefer you can change out the caramel bits for toffee chips. The caramel bits that I used are the Kraft brand. If there are leftovers it is best to store the bars in the refrigerator. Ohhhhhh, ahhhhhh. I love it. Another great looking bake ? One of the best Fall desserts! I just can’t get enough of pumpkin treats. I love pumpkin but not the pie so much – it’s just so mushy and goopy. These bars make me very happy! They have lots of delicious stuff going on along with the pumpkin which is what I love. All the textures and flavors – perfect. 6 kinds of pies!? Wow, your sister is really a baking guru when it comes to Turkey Day! 🙂 I personally always have to have my pecan pie on Thanksgiving. It’s kind of a tradition for me. But I’ve gotta say that these bars sound quite delicious!